Cotton has been around for a very long time since seeds dating back to 450 BC have been found. It is also the most widely made natural fiber today. Cotton grows from the seed coat of cotton plants. But this is not an easy process because before cotton can be turned into hijabs or t-shirts, the cotton seeds need to be separated from the plant and then the fiber from the seeds. An interesting trivia is that cotton you use is made up of carbohydrates! Most animal fibres are actually made of proteins. Cotton fibers however are made of a carbohydrate called cellulose. It is very difficult to say what is an advantage or disadvantage of a certain fabric or style because this is very subjective. Something that may be appealing to one person for a reason may be the exact reason why another person finds it uncomfortable. So we will list various defining attributes and characteristics of Cotton hijabs for you to make the choice easier. Knowing these facts will help you narrow down what hijab styles and fabrics you should choose for which occasions. Cotton is a natural fabric hence hypoallergenic, so it is great for people that are not able to wear synthetic material because of allergies. It is an unfortunate fact that a lot of people these days are getting allergic to artificial materials, cotton is the safest and most reliable material in this case. So if your skin reacts to any synthetic fibres, cotton hijab is the way to go. 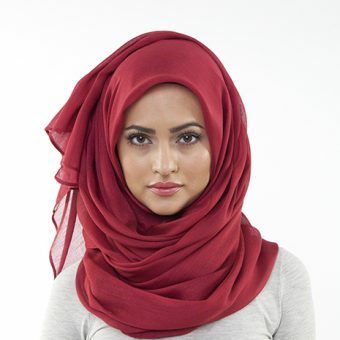 Cotton hijabs are soft and natural are comfortable to wear. They keep you cool in summer and also certain types of cotton because of their insulating nature also keep you warm in winter and as an added bonus it is one material that resists that horrible static cling that we all hate so much! Cotton hijabs are readily available on the market and suits all budgets as the material is available in different price ranges, so no need to despair if you do not want to spend too much money on your next set of hijabs. Cotton hijabs are easy to clean. Almost all cotton hijabs can be machine washed even at high temperatures. They can also be dry cleaned if needed. Cotton hijabs also dye very well, so if you are after brightly coloured hijabs, cotton hijabs are your best choice. Pure cotton hijabs tend to wrinkle and also shrink easily. So if you are the person who doesn’t like ironing, then pure cotton hijabs may not be suitable for you. Cotton hijabs can attract mold if left damp and dirty! Cotton hijabs are very absorbent which is also a con since it takes much longer to dry than most other types of hijabs. Cotton hijabs can also stain very easily. When Should I Wear A Cotton Hijab? Cotton hijabs are best worn casually. They do not work so great for evening or parties/wedding wear, but worn along with a pair of jeans and a pretty top or a long Abaya to go out and meet friends or to go to that lecture you might be wishing to miss, a cotton hijab is great!